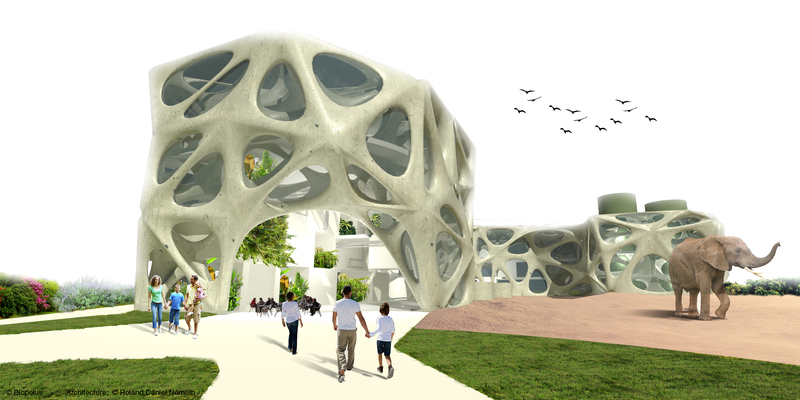 Emergence of biotechnology and ecological systems has prompted a revolution in design and engineering. 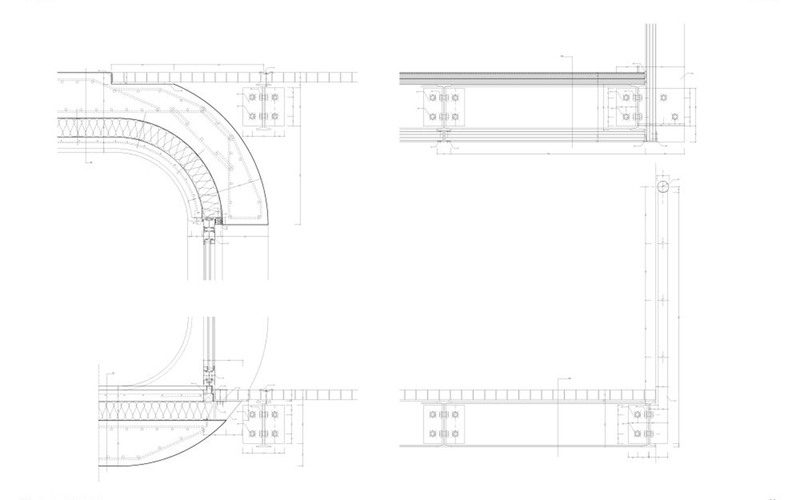 Using a combined engineering and design approach, we create an efficient and pleasant Product, Building or Facility for your technology. 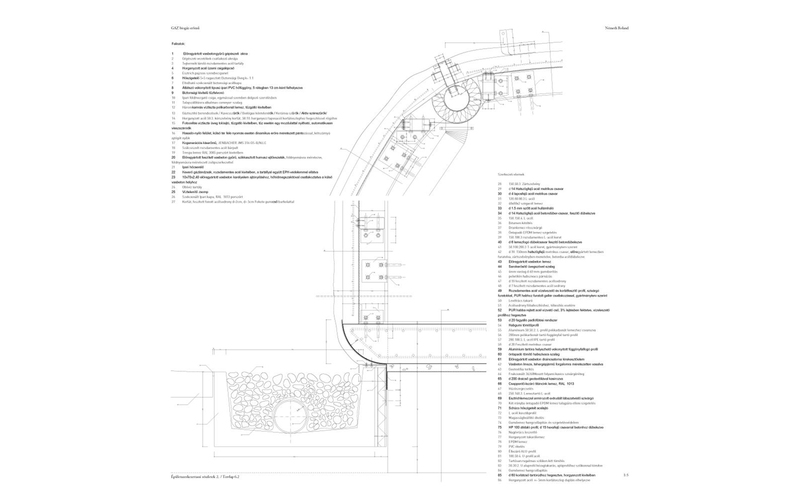 Restructuring of these systems can lead to reduced maintenance costs, more pleasant facility environment. 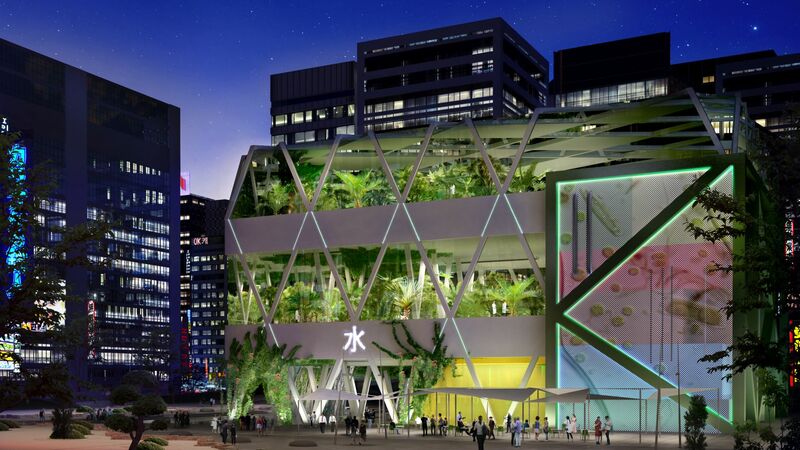 to cut operational and construction costs. 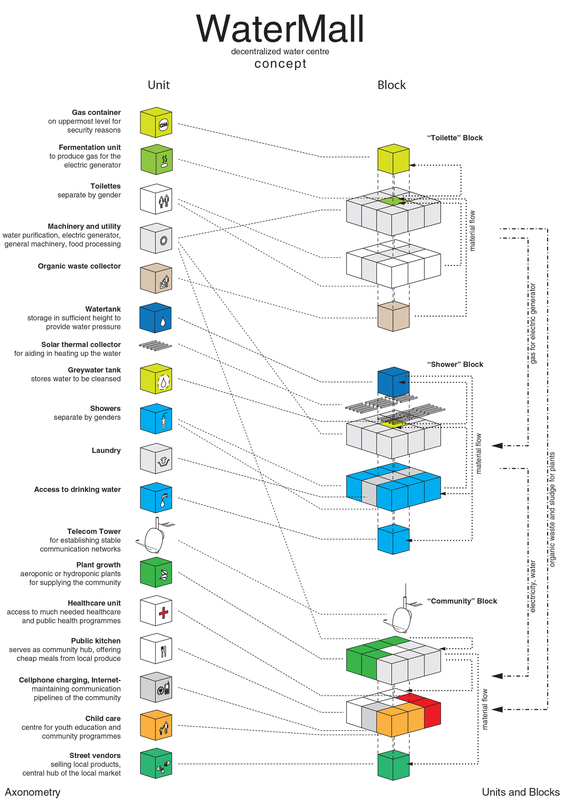 This avoids spacial conflicts during construction and operation, and can have organizational and operational benefits. 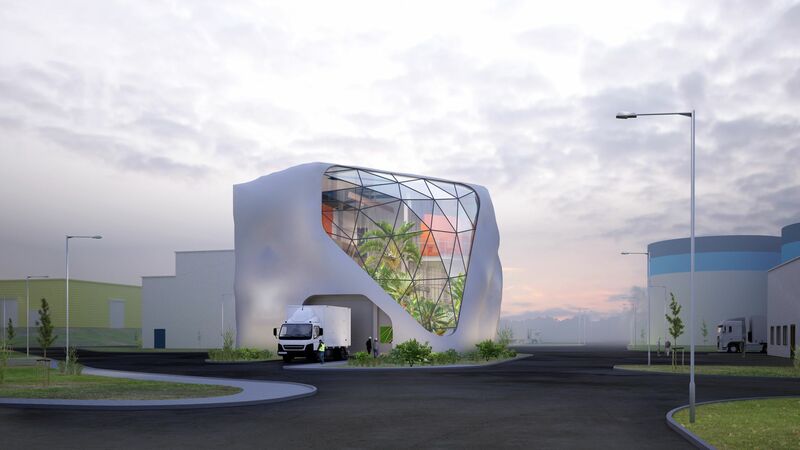 Climate responsive and energy-conscious architectural design lowers energy consumption costs for your facility. 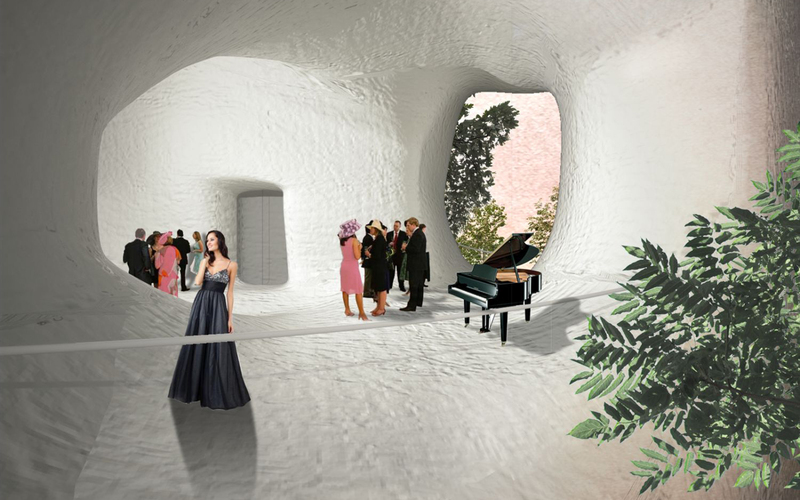 We create useful architecture, which provides a pleasant environment at the same time. 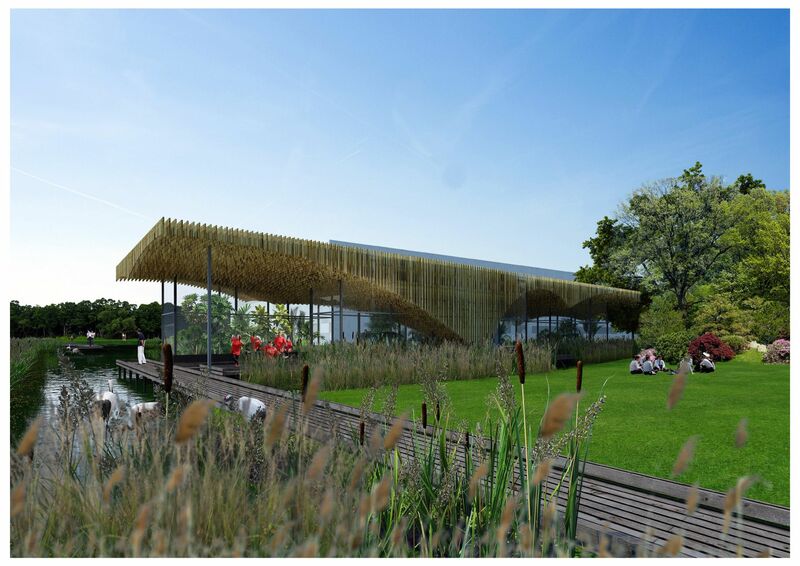 A high tech and beautiful wastewater treatment plant to replace the old activated sludge facility at Bergermeer. 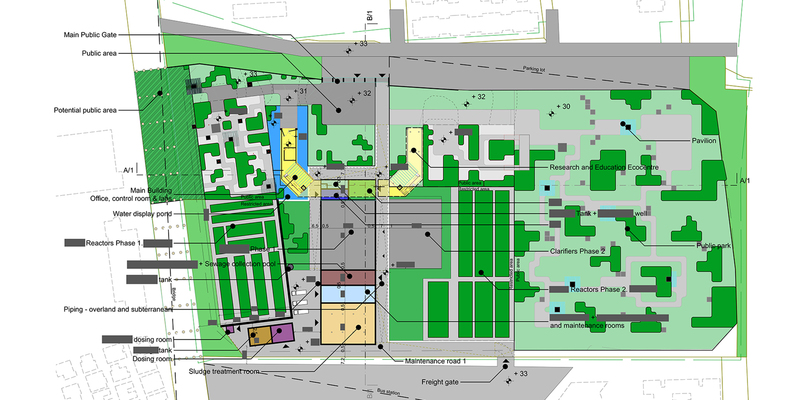 With the new design we could reduce the footprint to 10% of the original facility, freeign up valuable land for development. 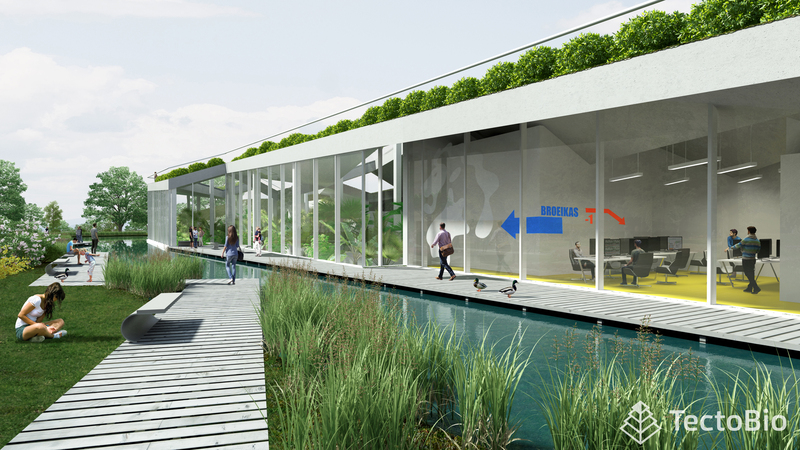 In addition, the treatment facility itself maintains a biotope pond for the recreational zone of the are, adding real value from day 1. 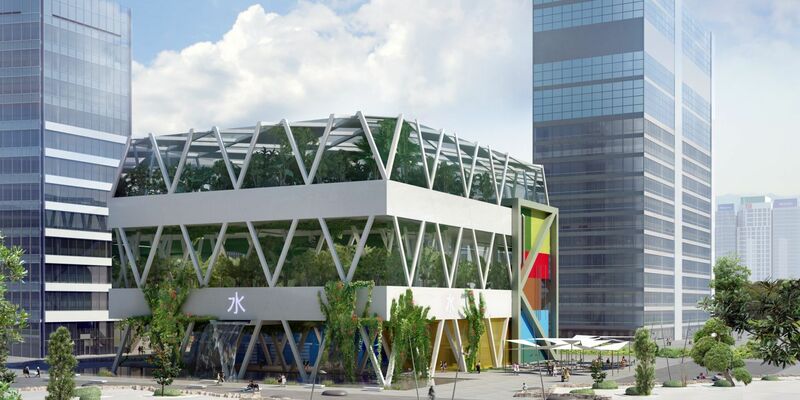 A facility for artificial closed indoor agriculture, aeroponic cultivation of high value plants, optimized for the climate of Shenzhen, PRC. 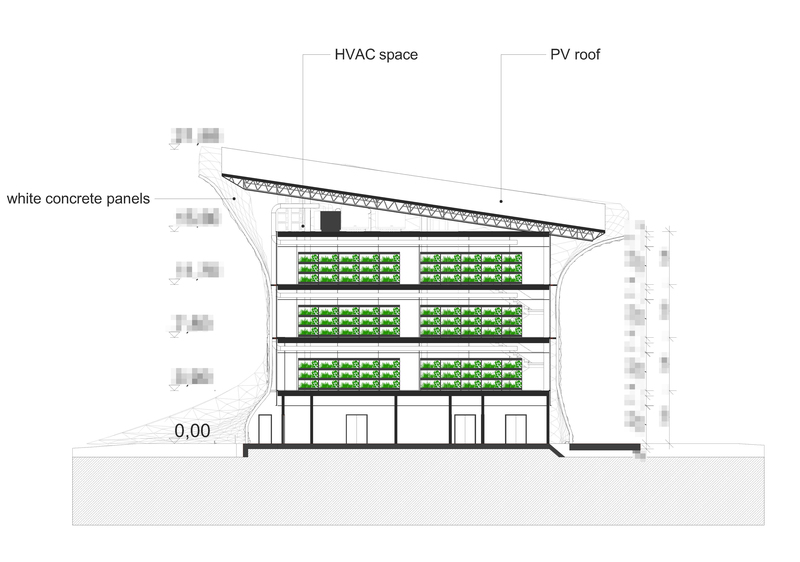 The facility shape derives from the need to reduce radiant heat gain, while providing as much photovoltaic roof area as possible for the high electricity needs of the artificial lights of the cultivation. 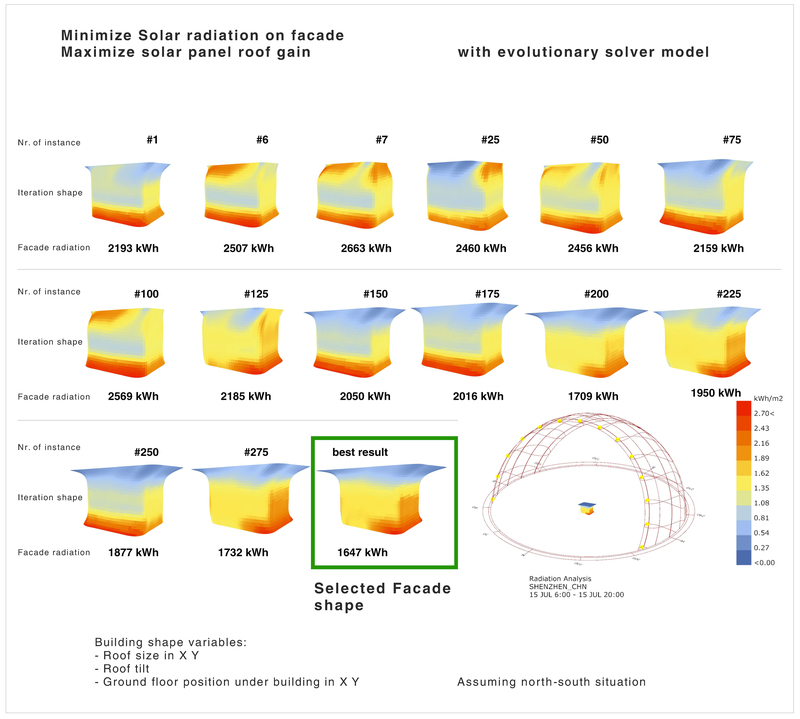 Evolutionary computing determined the optimal roof angle, and the optimal facade shape for maximal energy gain and minimal cooling needs. 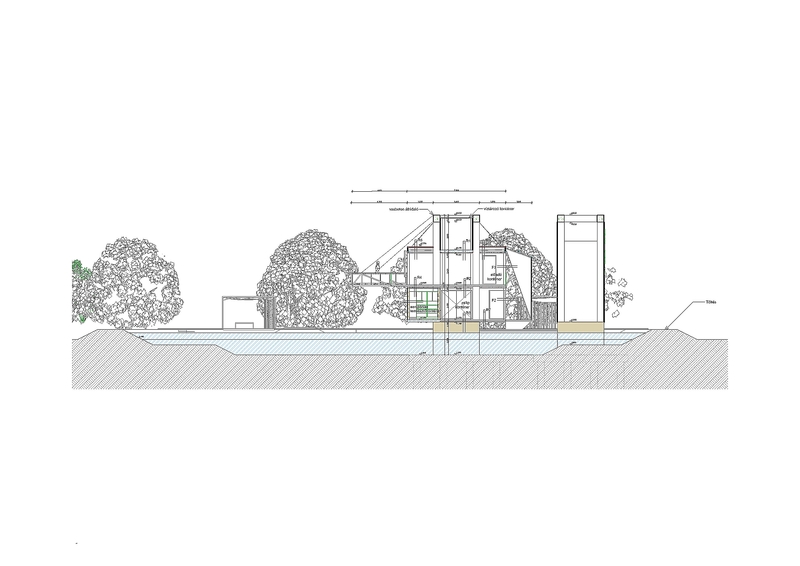 The resource extraction Pilot plant is a testbed for wastewater resource extraction technologies to be tried and tested before large scale application. 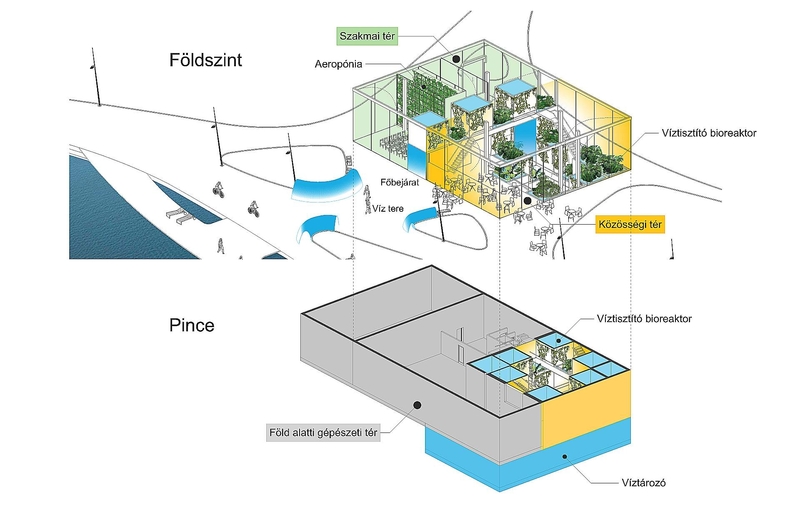 Integrated into the high-tech facility grounds of Budapest Central Water Treatment Plant, it's position at the main entrance aims to showcase bright technological future of ecological infrastructures. 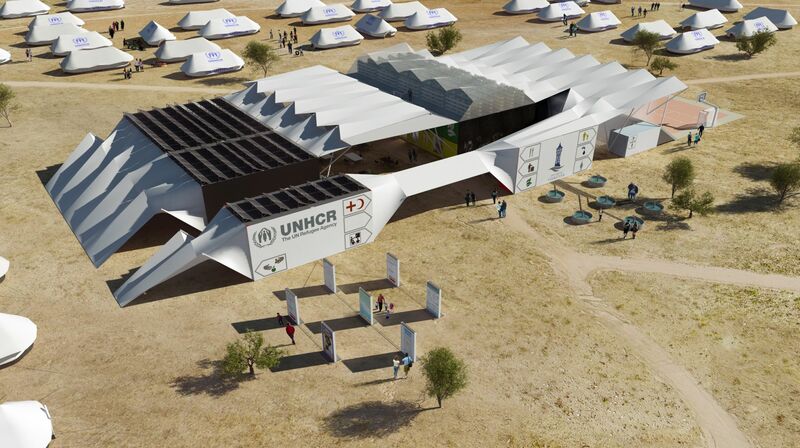 Multipurpose centre for rapid deployment in refugee situations, that consists only of standard shipping containers, with a light tent structure for weather protection over the communal spaces. 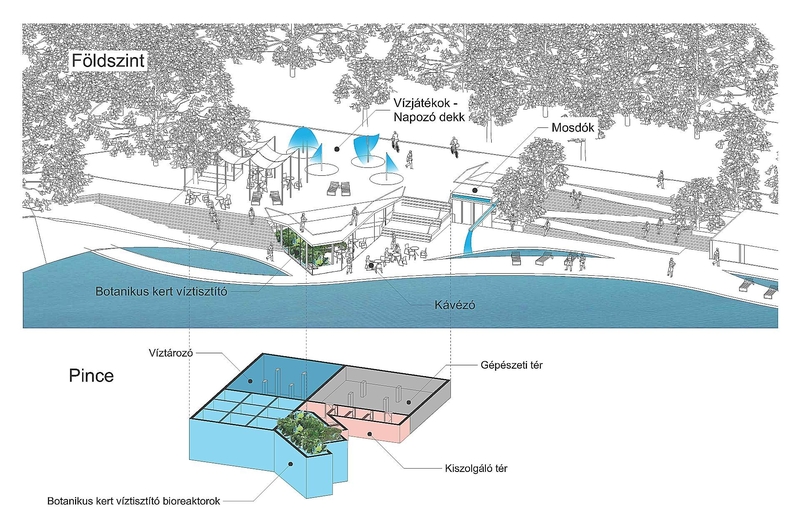 Two pavilions were designed to perform various heat exchange and water treatment objectives, such as using the effluent warm water from the nearby bath to heat the museums nearby, and provide fresh water for the park lake in the process, as well as processing the compost of the park and using the lake effluent to make nutritious water for the park greenery maintenance. 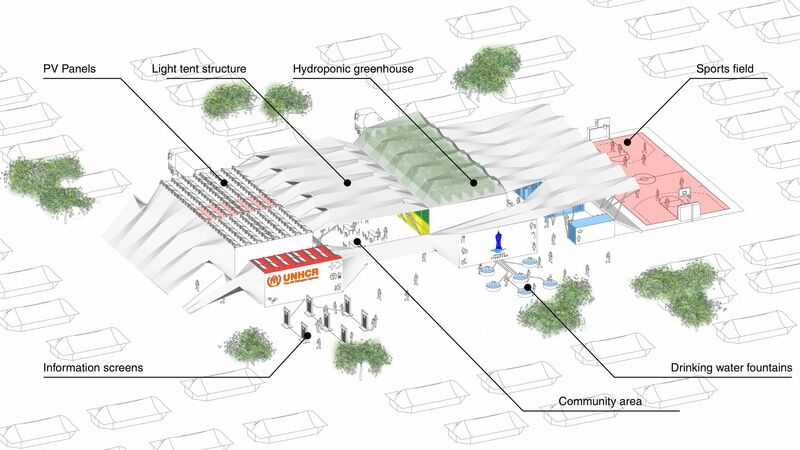 The structure of the main pavilion uses heat exchange funnels made of membrane structure to heat the greenhouse space for the tropical water cleaning plants, as well as providing a support structure for the plants, just as an artificial tree. 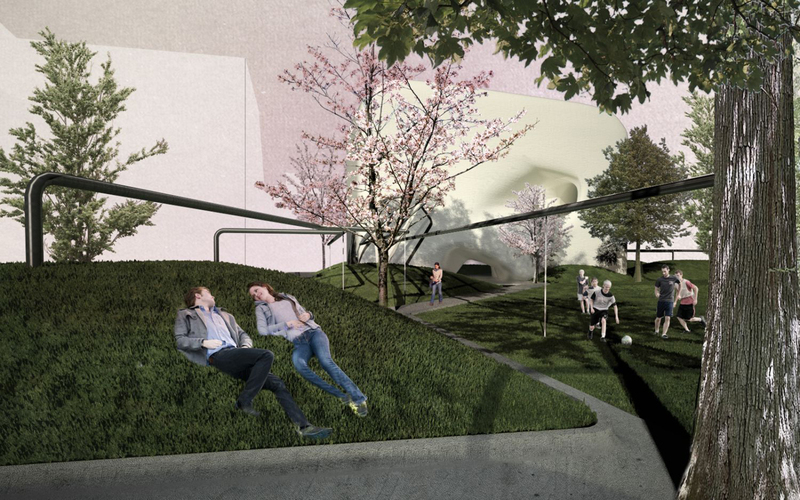 The proposal won 2nd prize on the Liget Budapest Landscaping competition in collaboration with Lépték-Terv Landscape architects and Biopolus Technológiák Zrt. 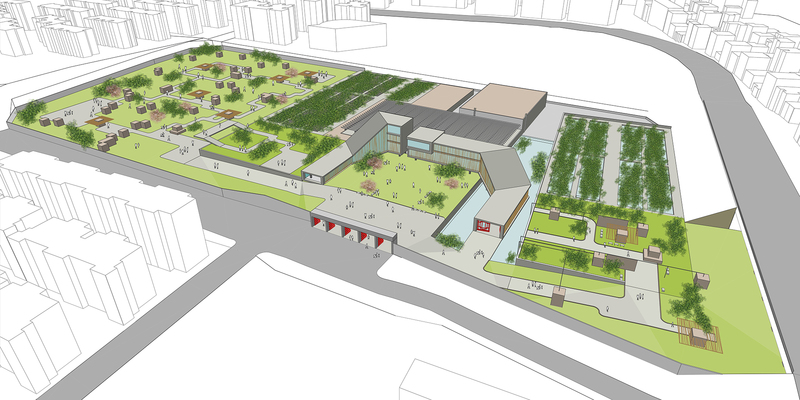 Concept design for the city centre of the wastewater treatment plant in Kitakyushu, Japan. 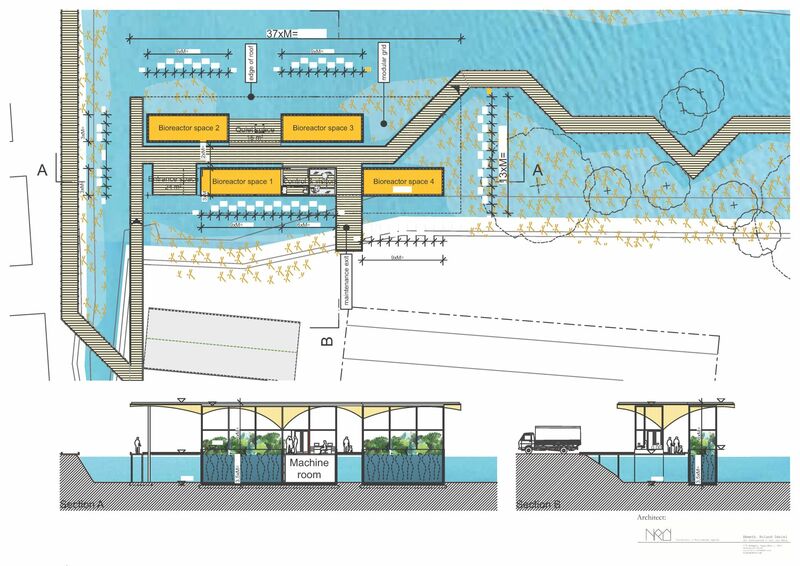 High property prices and advanced water treatment technologies call for and enable the placement of water treatment facilities in dense, central urban areas. 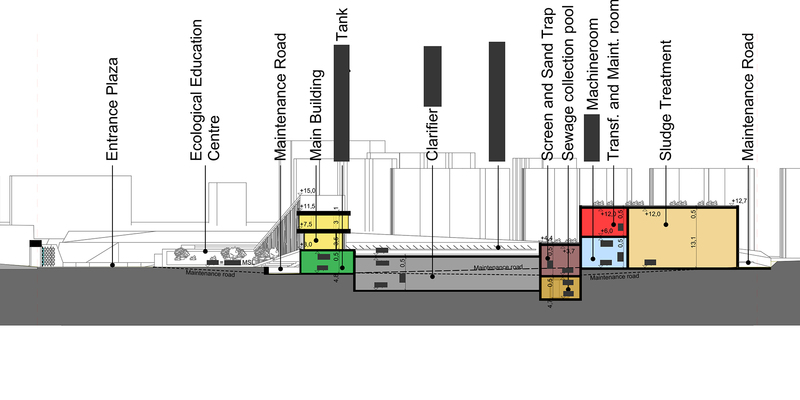 Such facilities can even improve the public spaces, if done correctly. 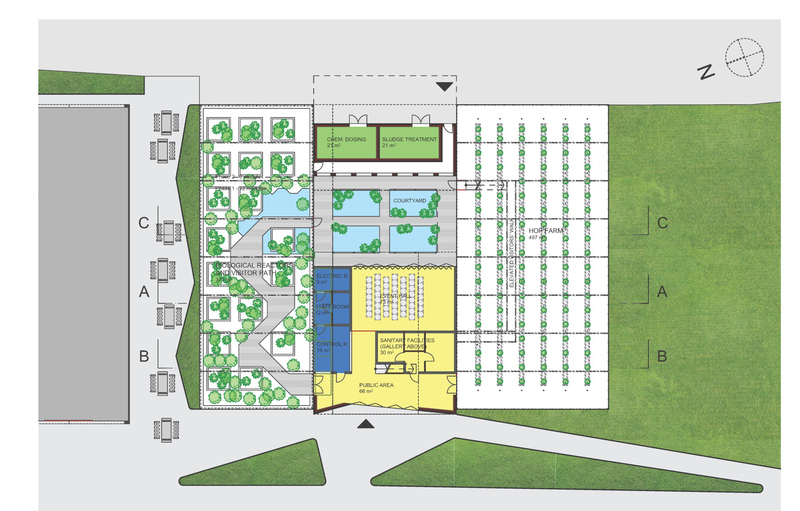 Our facility design aims to improve such urban environments, while providing tangible financial gain. 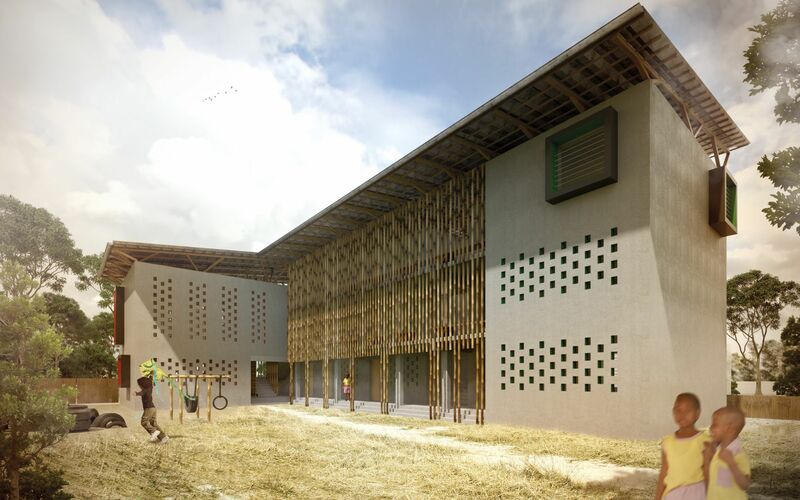 The develpoment of Newill Academy in Ghana was started as a charity project to advance the education of children from poor families. 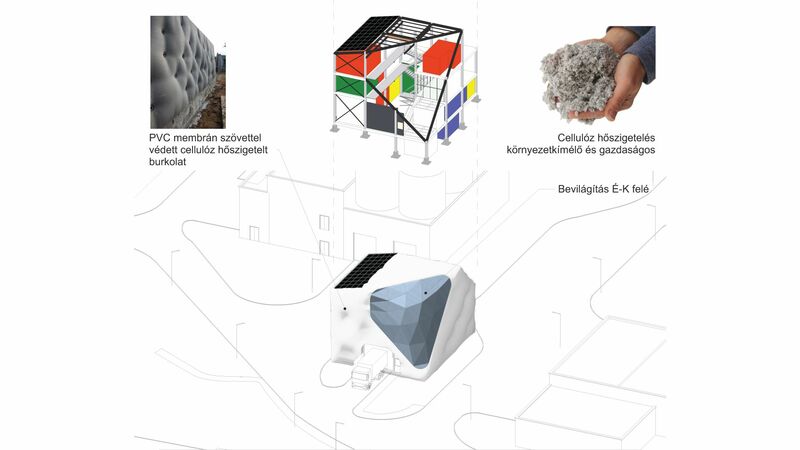 Helping the design team to incorporate passive ventilation, rainwater harvesting, greywater circulation, and solar panel systems into the low cost building was a welcome challenge, very different from the ususal high-tech environment. 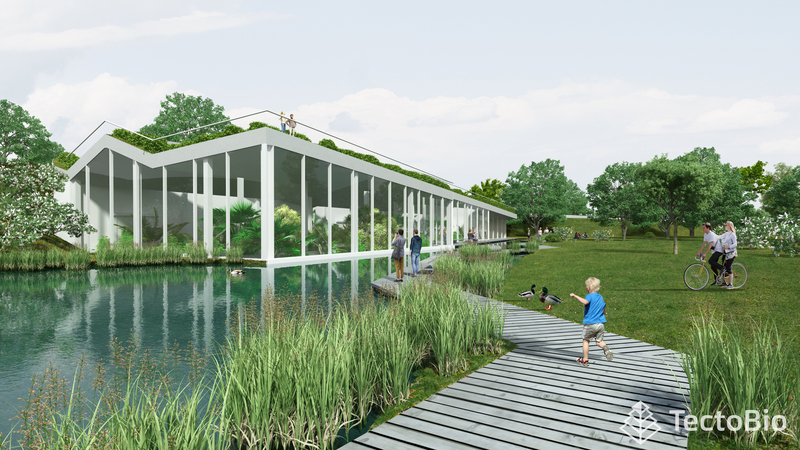 The building is designed to help with the recovery of eutrophic small ponds and lakes. 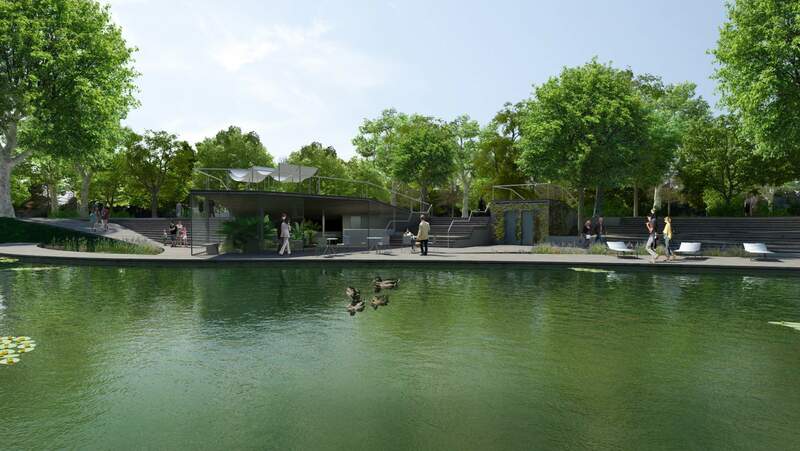 It uses a prefabricated structure with the necessary machinery and biofilm media, to inoculate the ponds with beneficial microorganisms, restoring the equilibrium of the pond. 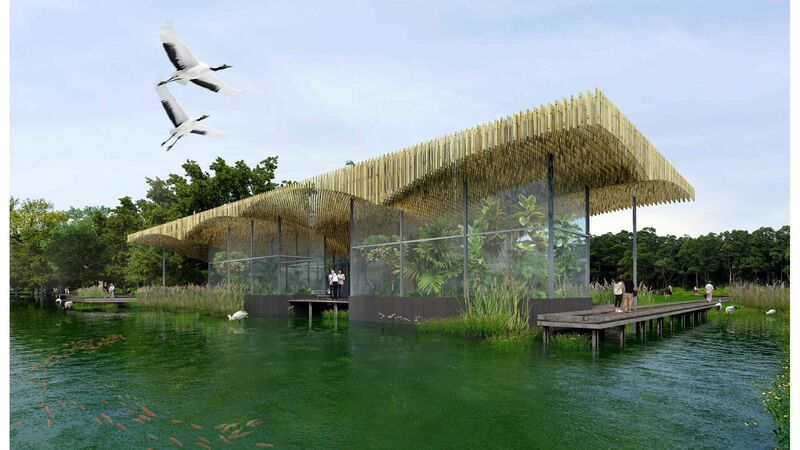 The roof is made of panels of CNC milled local reed, bleding the whole structure into the serene landscape, achieving a calm presence, and full unity with the local fauna. 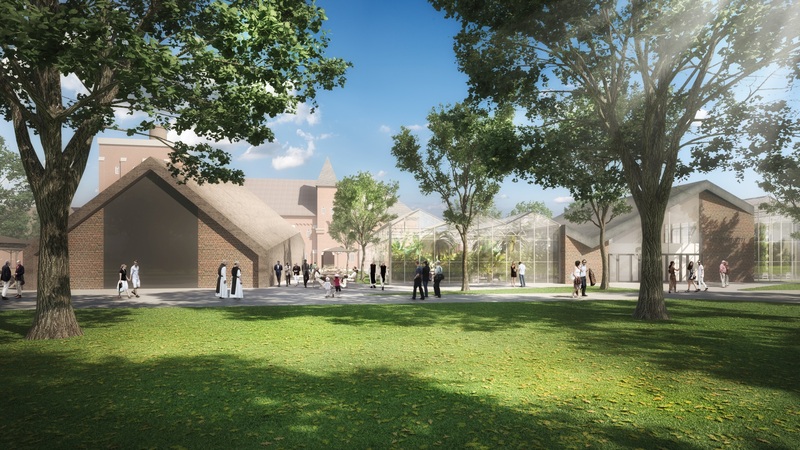 Designing a high-tech facility, a "Biomakerij", that fits seamlessly into the historic structure of an old dutch abbey is never an easy task. 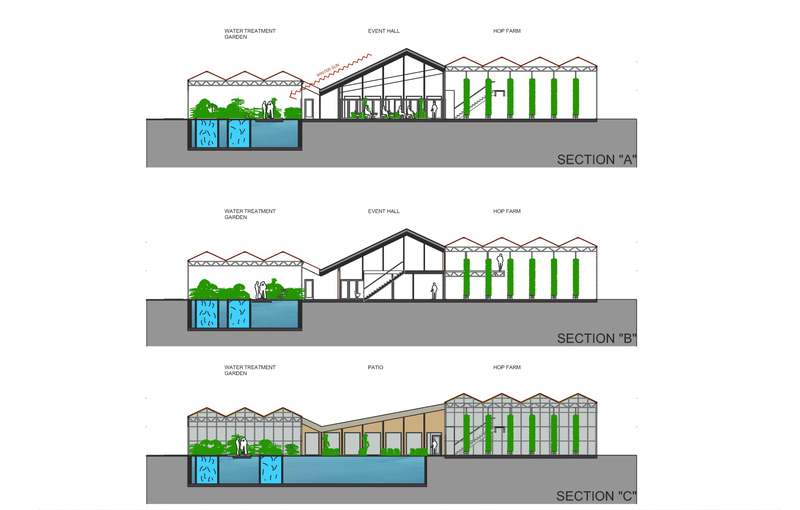 At our proposal for the wwtp, social hub and hydroponic hop farm required by the La Trappe brewery of the abbey, we managed to combine all three functions into a neat and fitting envelope. 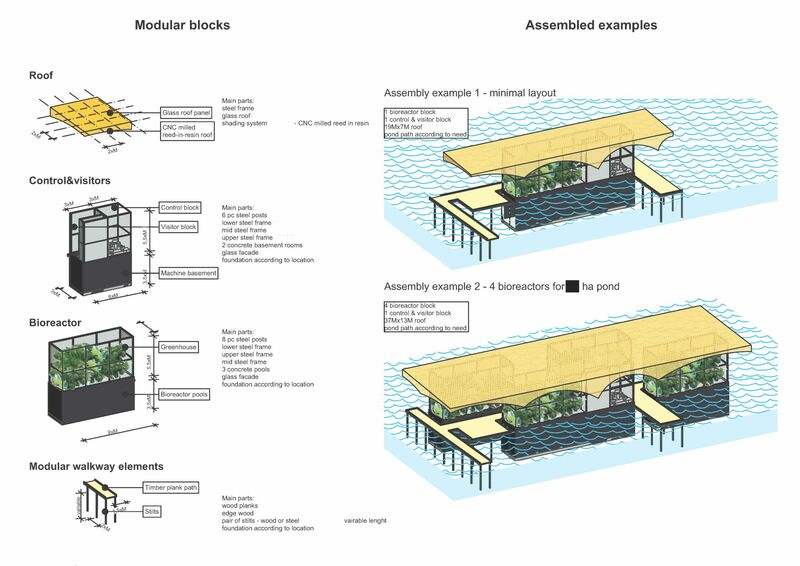 Planned for both multi phased realisation, and future extension possibilities, it uses simple local materials with prefabricated structures, while still remaining a beautiful part of the ensemble. 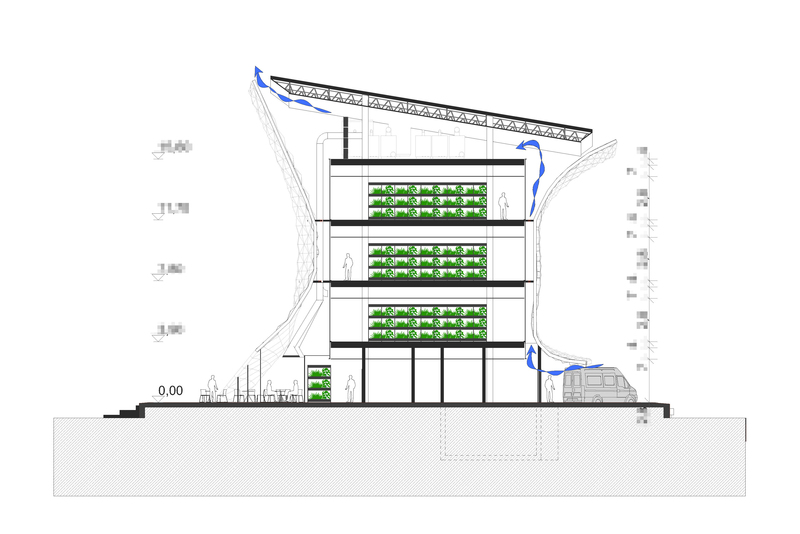 The building was designed with optimal sunshine and thermal characteristics in mind. 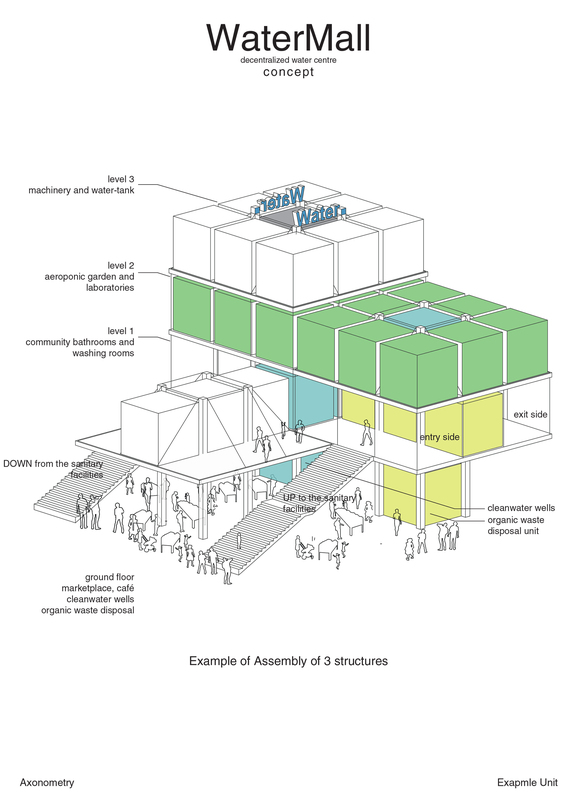 The modular aeroponic farm designed for Budapest Waterworks is a first-of-it’s kind modular, enlargeable aeroponic farming system. 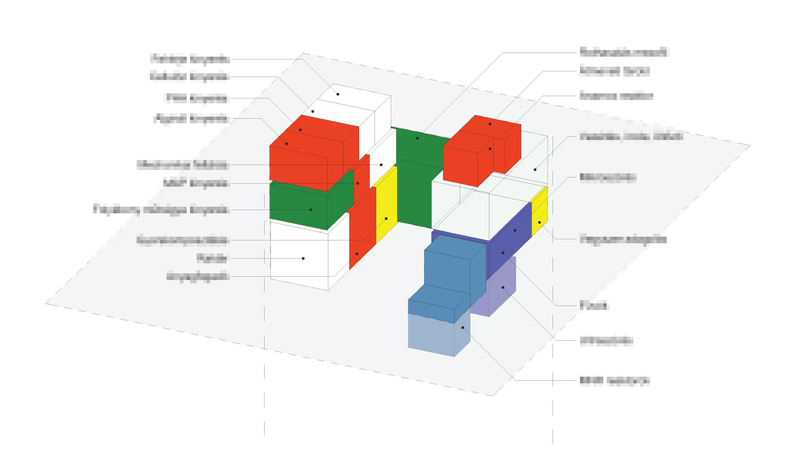 The purpose made and standardised elements of the building unit can be assembled into clusters of growing buildings. 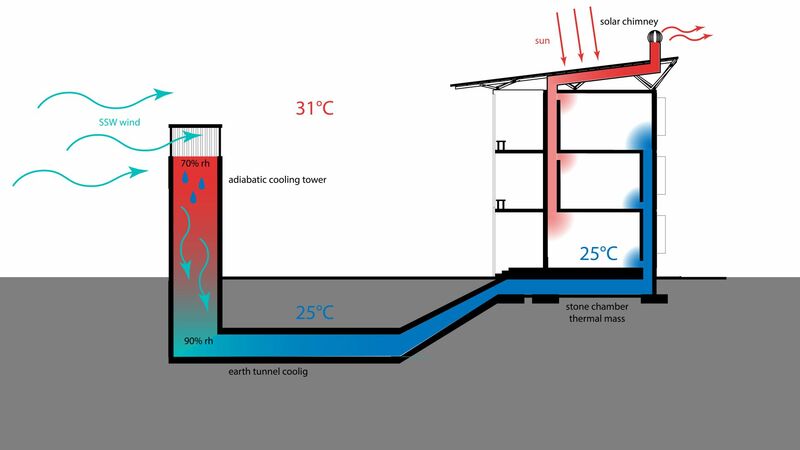 Utilizing solar-chimney, thermal mass storage, photovoltaic cells, and other renewable energy solutions to minimize operational costs. 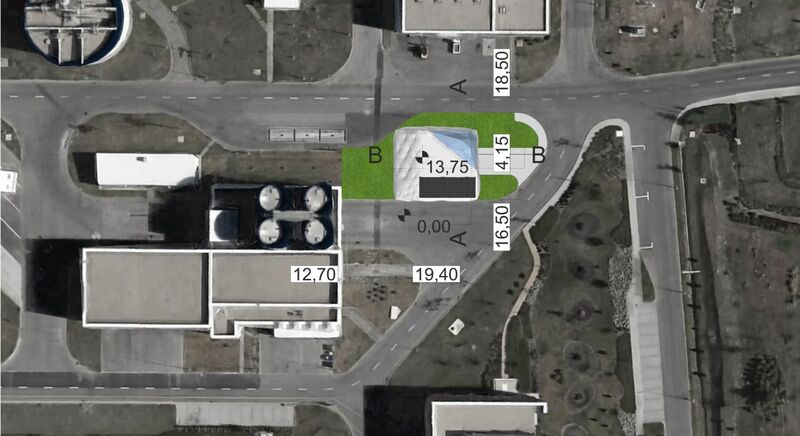 The design is currently at permit plan level. 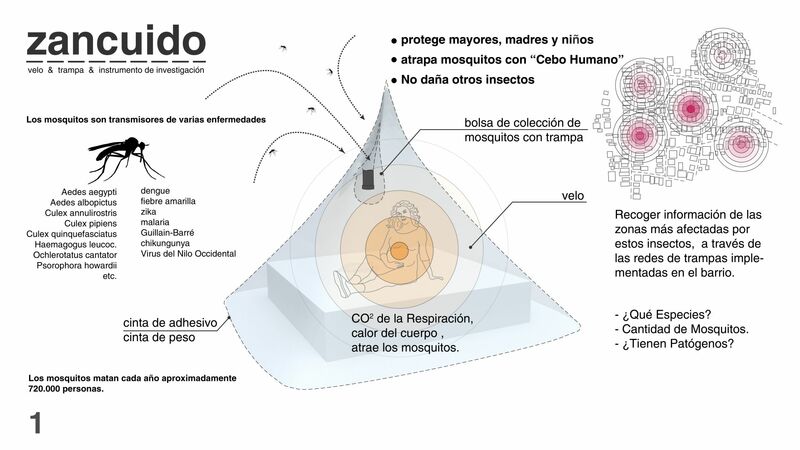 Investigation of mosquito life-cycles and movement patterns have yielded a tool for protection against mosquitos. ZanCuido -tm- lures mosquitos with human smell and CO2, as well as desirable high contrast bait colors, all without additional chemicals. 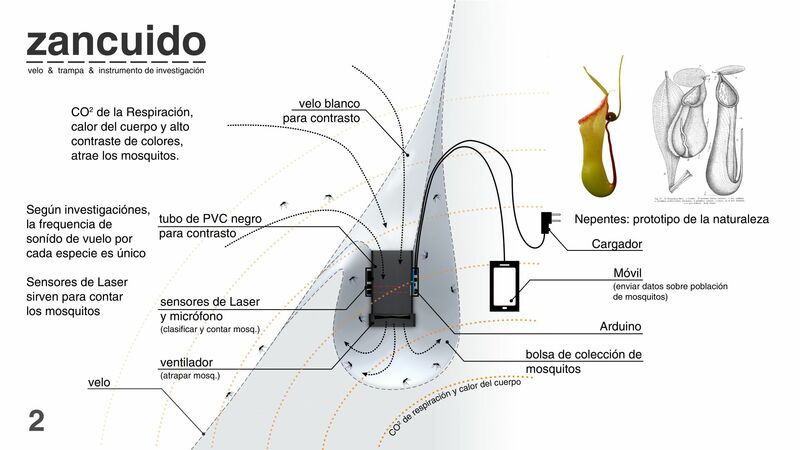 Not only does it trap the disease vectors, it also categorises the mosquito strain with advanced sound and laser sensors, and sends automated updates about mosquito population to local health authorities. 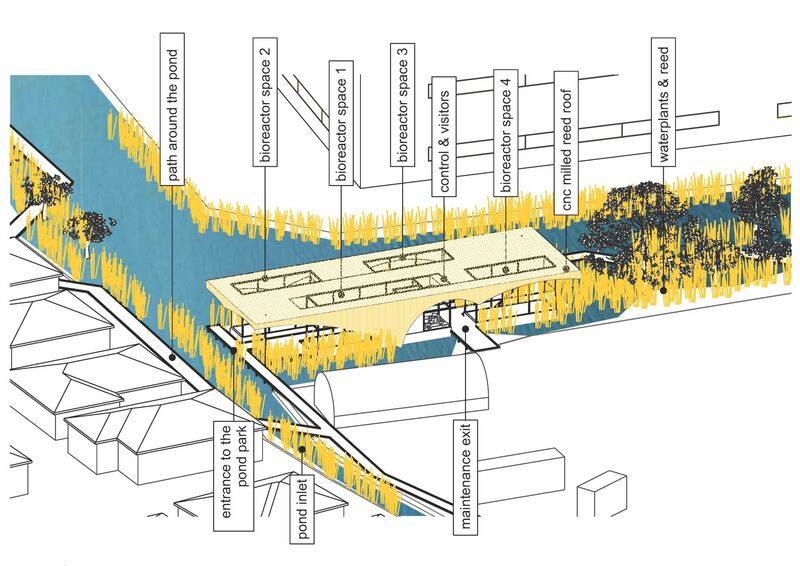 This data enables rapid and precise response before mosquito borne disease outbreaks might occur in any location. 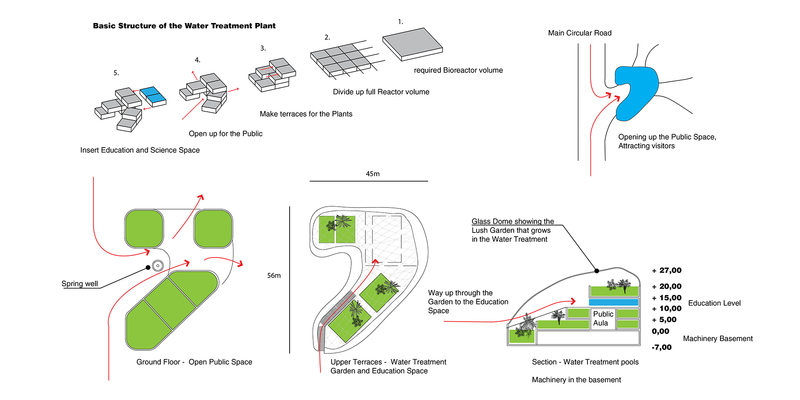 Proposal for the new wastewater treatment plant of the city of Buji, Shenzhen. 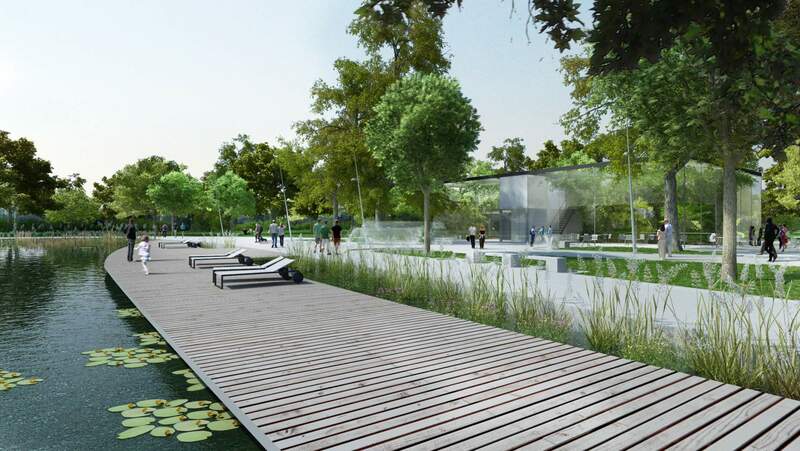 The city-centre facility design provides the city of tropical climate with a pleasant, water-cooled public park, combined with a state of the art treatment facility, and a water quality research and education centre. 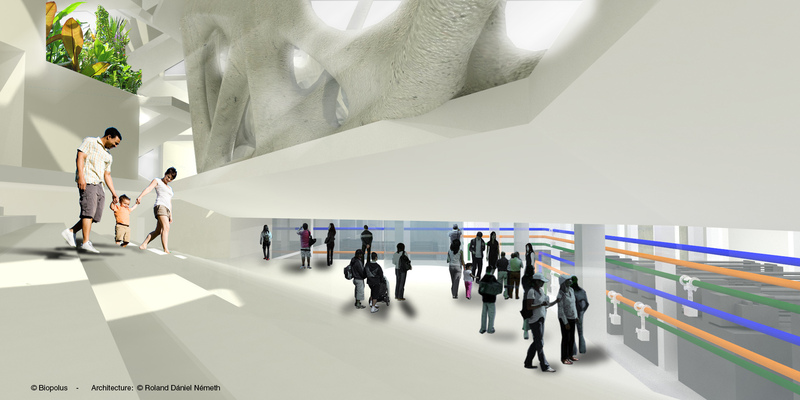 Designed for Biopolus Technologies. 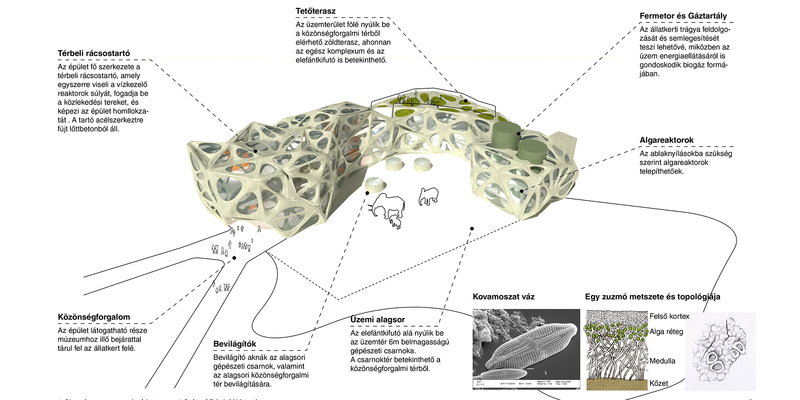 Concept design of the energy management and distribution centre of the newly extended Budapest Zoo, commissioned by Biopolus Institute. 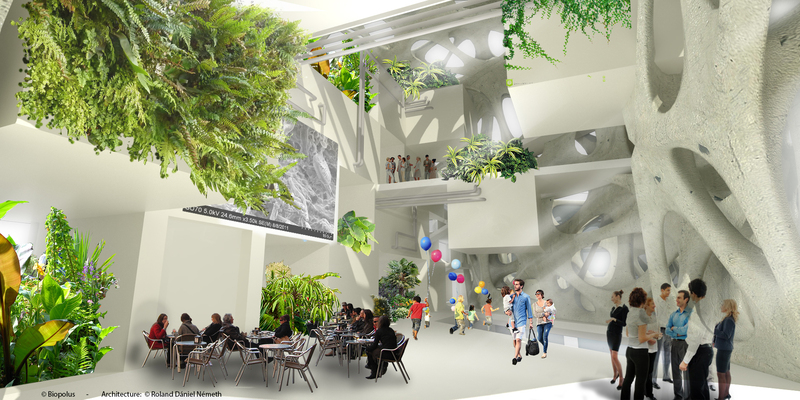 The building allows for near complete energy circulation and waste reuse of the Zoo, housing all the necessary equipment and machinery, while also allowing the zoo visitors to safely experience the microbial fauna of water clearance process and waste reuse. 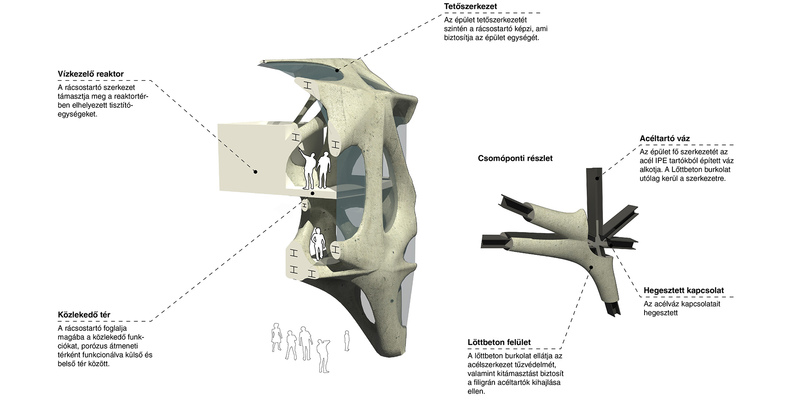 The section of the building draws its inspiration from the section of crustose lichen, the porous structure housing the symbiotic algae units. 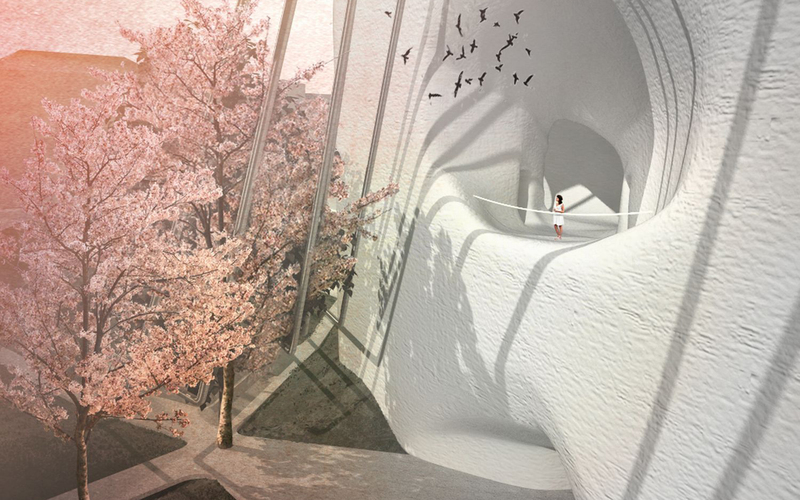 It is built from steel beams, covered in spray applied concrete, “shotcrete”, that gives it a thermal mass for balancing the temperature of the building, and prevents bending of the slim beams under excessive pressure by the water processing pools suspended over the heads of the visitors. 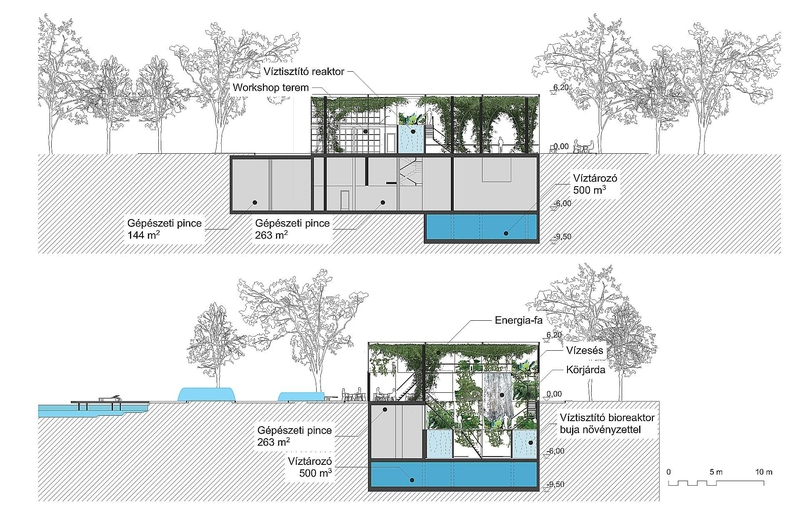 The back half of the eco-centre is reserved for the operators, who are keeping a watch over the biotopes, as well as the small biogas facility. 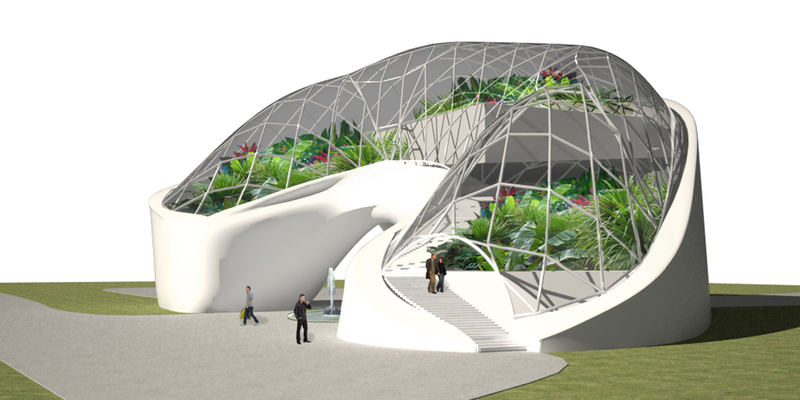 A proposal for the water treatment pavilion of the Expo ’17, for Biopolus Institute. 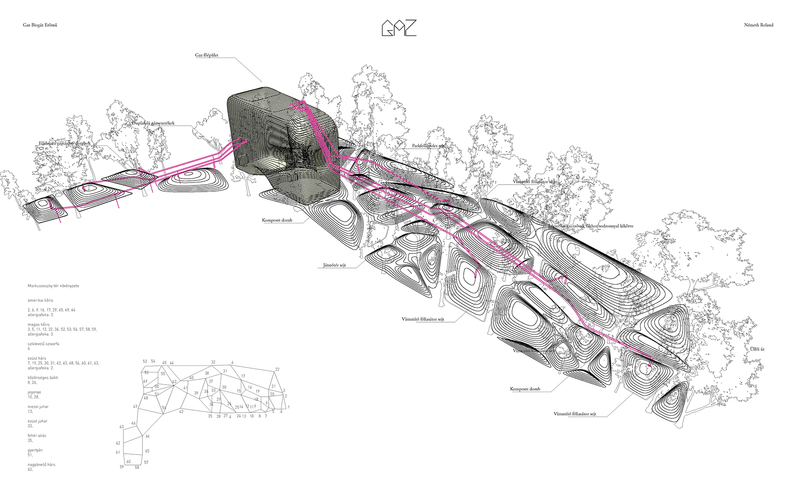 Public space meets technology meets nature. 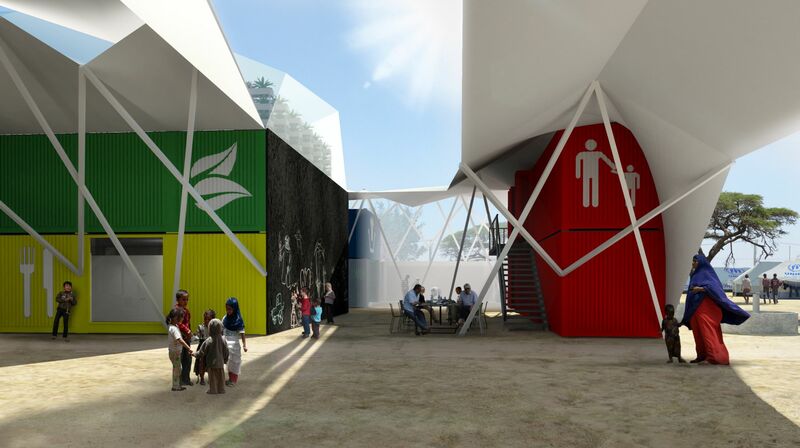 The pavilion is a showcase for state-of-the-art water treatment technologies for the sustainable city themed expo. 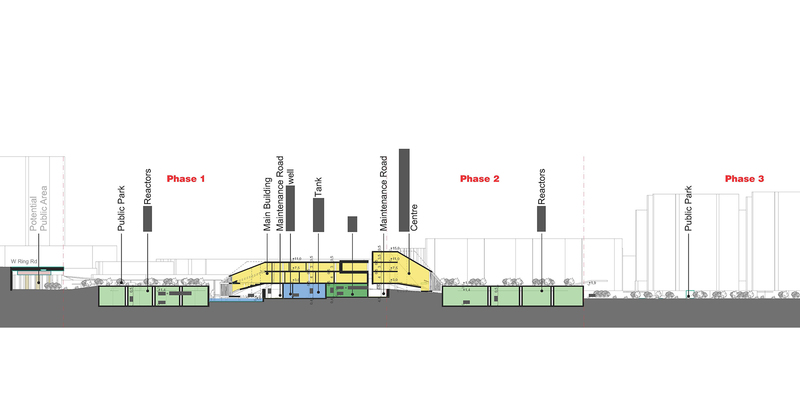 The high-tech architecture is in accordance with the expo 2017 masterplan of Adrian Smith + Gordon Gill. 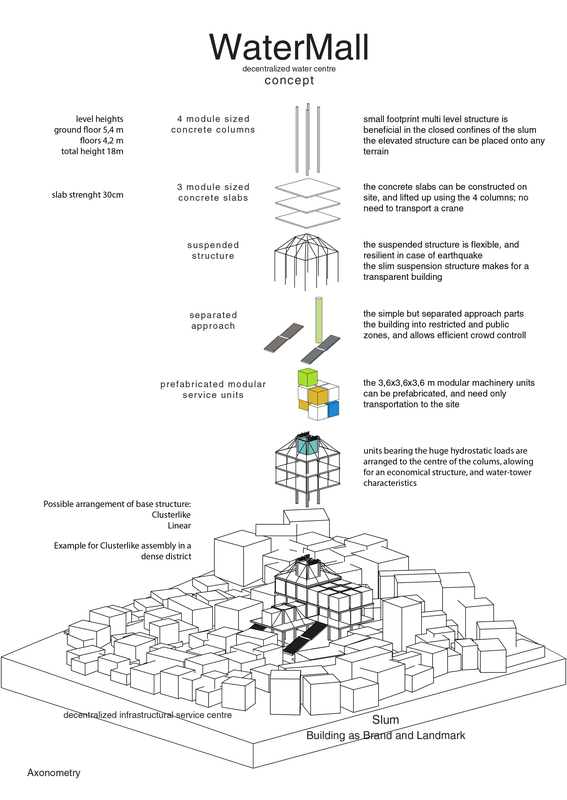 Concept design for a franchise system of modular ecological city-centres for cities experiencing a sprawl and/or insufficient infrastructural systems. 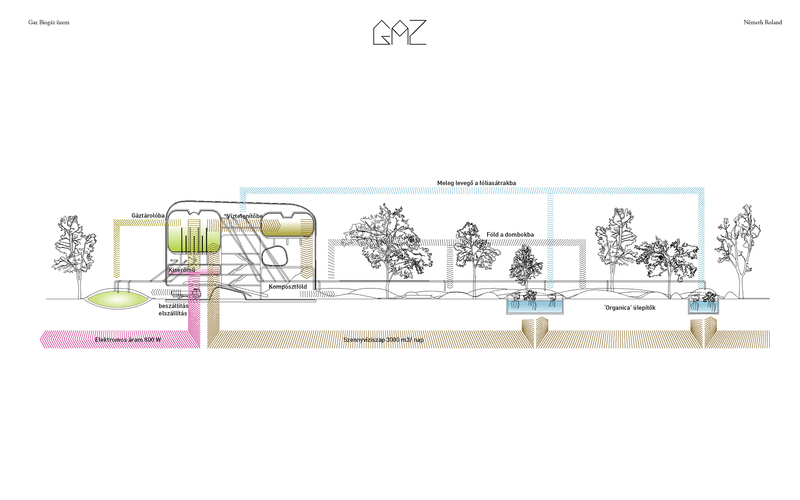 The framework design encompasses the inclusion of water-treatment, biogas-production, hydroponic growth, sanitation, composting and other metabolic infrastructure units. 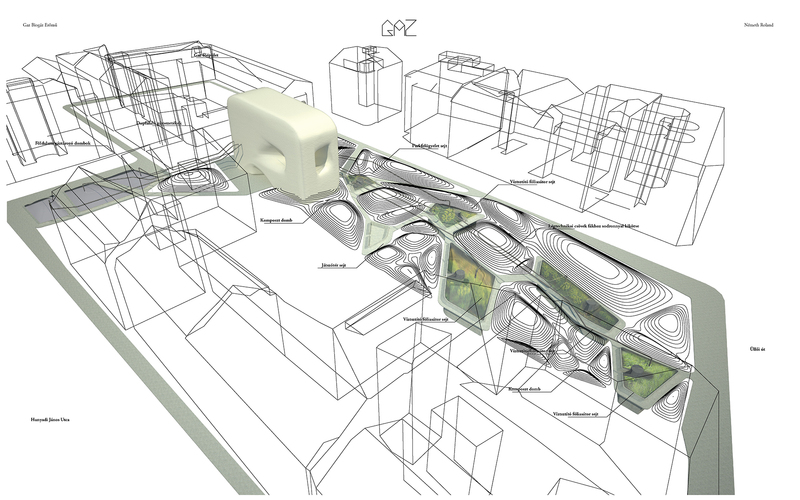 The flexible and low-cost system can be successfully deployed in any terrain, at any urban density level. 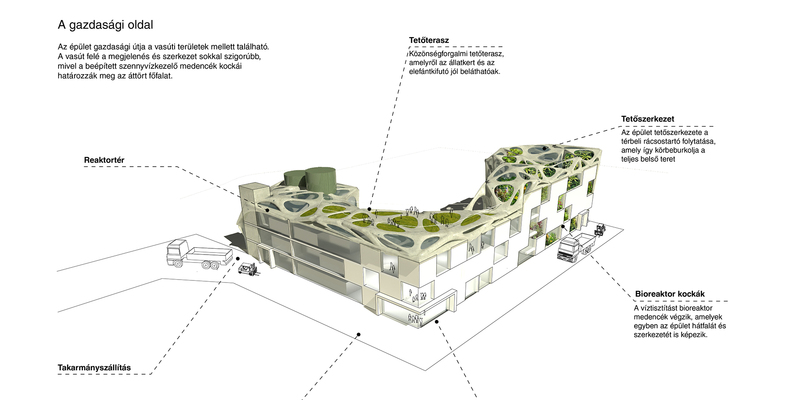 System proposal for Biopolus Institute. 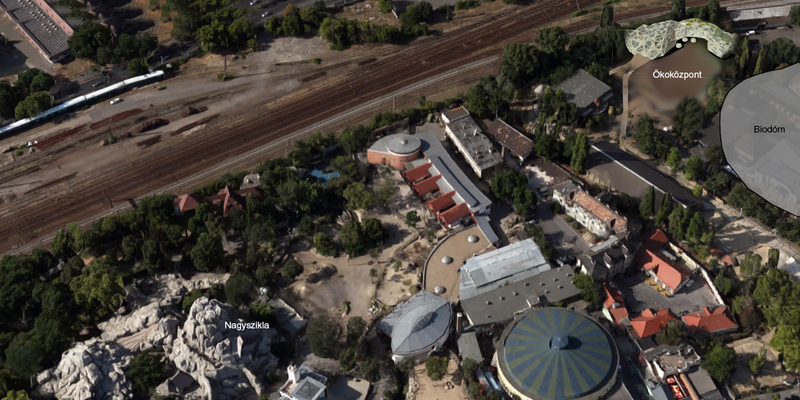 A biogas factory in the heart of Budapest. 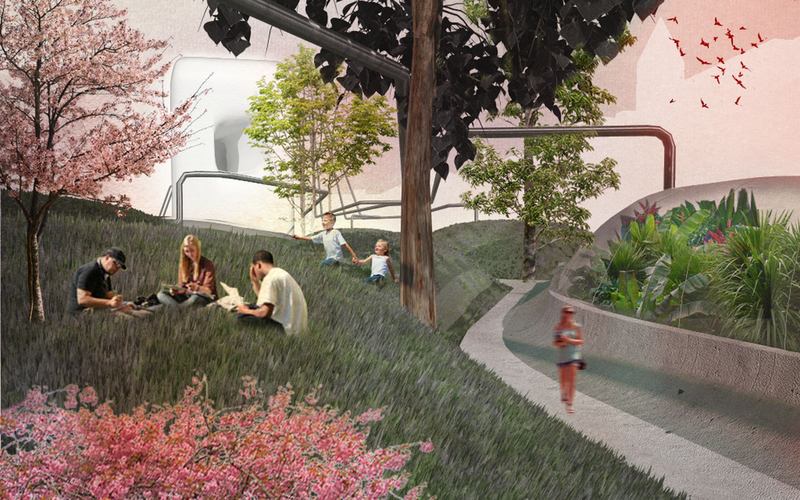 The proposal aims to create a symbiosis between city, infrastructure and nature. 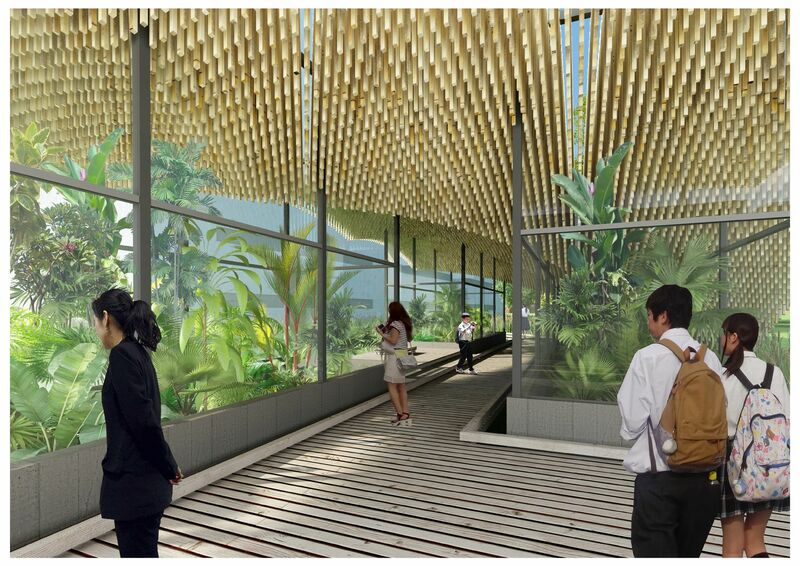 Water gets treated in wastewater treatment pools, where tropic plants are planted on metal grids, doing the cleaning with their roots, synthetic root membranes and microbes, according to „Organica Water’s” licensed „living-machine” technology. 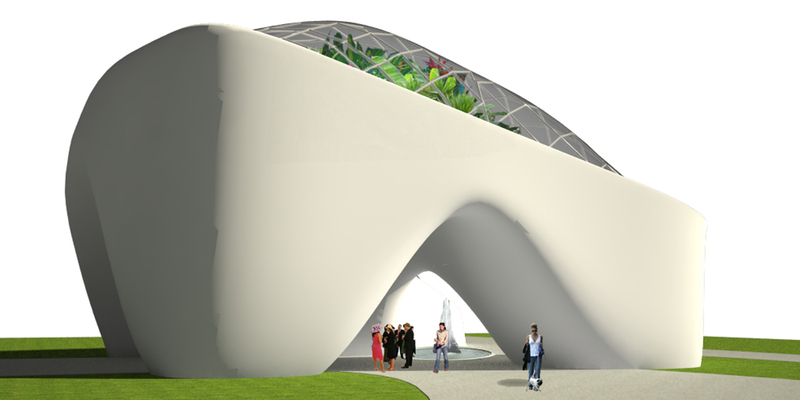 The planthouse-like pools are covered with Etfe membrane, and work as pneumatic structures. 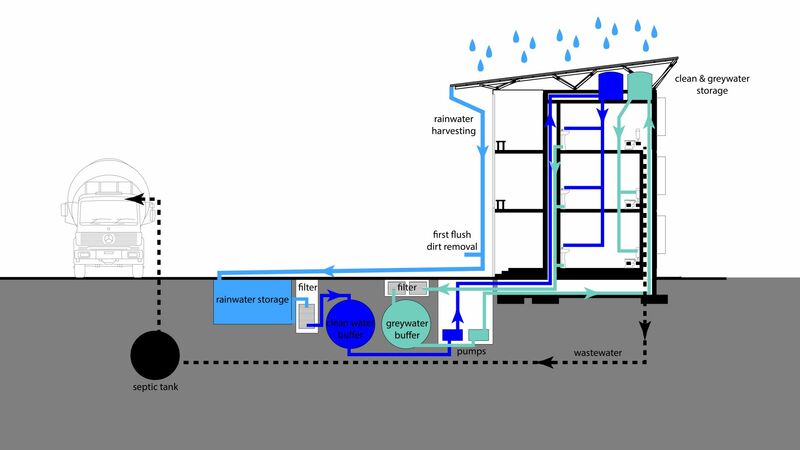 Digester tanks transform residue into biogas, and dewater the neutralized rest, according to the specifications by "Batortrade kft." 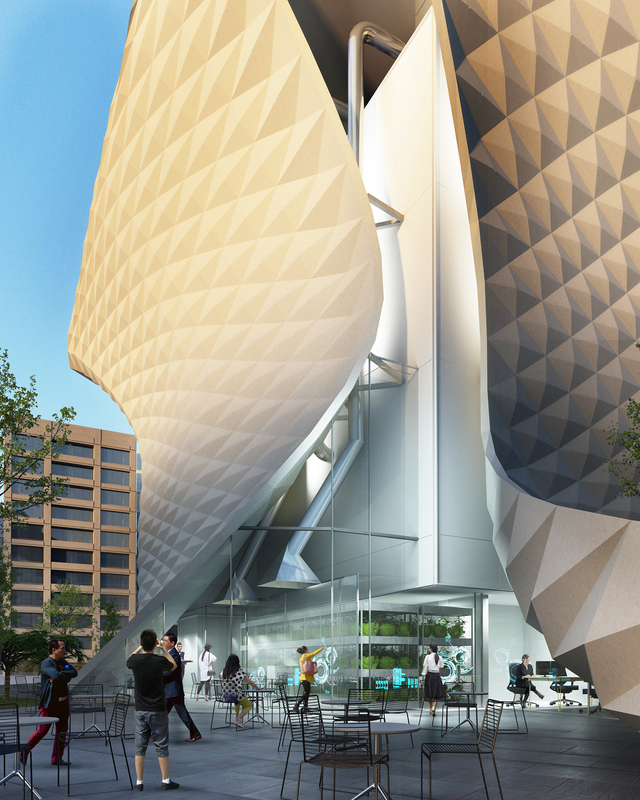 Heated air generated during the process heats the complex, and also through pipes inflates the etfe domes. 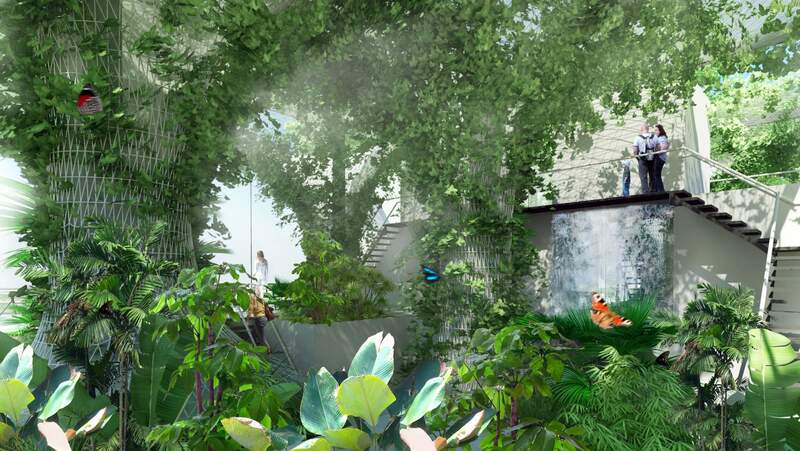 The secrets of the inner workings of the unit lure the people to have a looks inside, and ascend to the open loggia on the tree level. 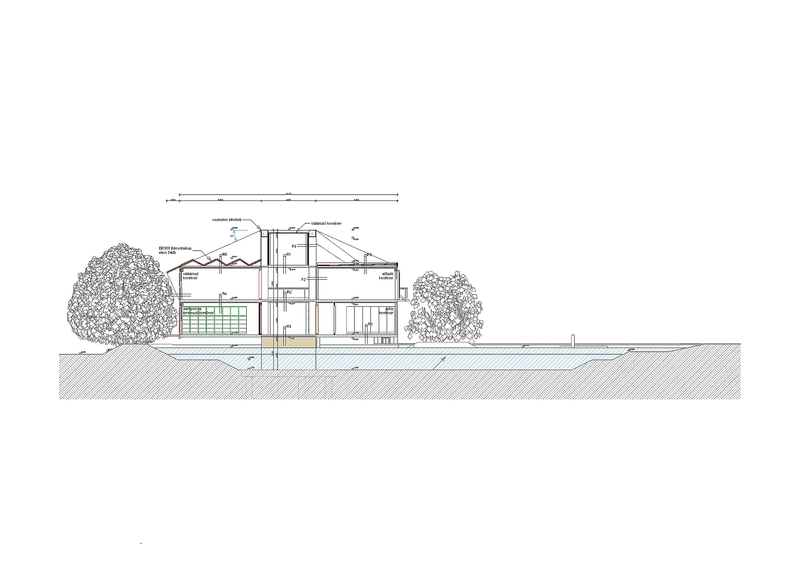 TectoBio, TectoBio.com and affiliated trademarks are property of SeniorSAP&Architects Kft.